It is worrying indeed Mike. But anything that hastens our departure from the Euro-capitalist mess is welcome, at least from my chair. Well, I do not live in the UK, but in an EU member state. If the UK leaves, very many Europeans would still be stuck in “the Euro-capitalist mess.” It is pretty hard for me to see how a UK exit, and such an isolationist attitude, can lead to peace and constraints on capitalism that would help keep me alive and well. I conjecture that it would start a process of balkanisation and either (1) wars or (2) easy pickings of the resulting states, for business interests, even those inside states. It is not necessarily isolationist George. Trade and congress with other nations will still be welcomed, but without the bureaucracy, and control by a minority, that currently exists. If you think back to before, it worked well enough, without the EU. At least,I think so. Just one opinion, naturally. Regards to you, in whatever EU member state you live in. Pete. The only way we can leave, is defeat this FTA, then STOP voting LibLabCon, as they are the corporate puppets! sec 75 of HSCA kicks in when this is signed and part of that is to stop all policy reversals AND make leaving the EU illegal? Thus ting our money to them! I live in Uppsala Sweden, but lived for 36 years in Amsterdam and before that 29 in America. In 09 I had to leave for Sweden quickly, to save my life from Dutch privatised healthcare, the first in the EU.I did this thanks to treaties in an EU package of such that allow for free movement of persons. Now, suppose you became seriously ill in a non-EU UK, with poor healthcare. You would be stuck.That is only one reason why I prefer a large EU. But Rollo is right. The European Commission is a bunch of nonelected technocrats who should be defeatef by defeating TTIP. Worse yet, they and others have far reaching ideas about a successor to TTIP called TISA. Exit from the EU won’t help under that. Please see this http://www.world-psi.org/en/media-release-psi-denounces-trade-services-agreement . @ beetleypete; It’s quiet obvious you haven’t read the article, or you don’t understand it? IF this deal is signed, late next year, NOT ONLY will we not be able to REVERSE policies made by previous governments, but we will be TIED to the EU for life, as leaving becomes ILLEGAL! Keep it civilised, please. I don’t like even mild personal attacks in my comment columns! Discuss the subject – don’t attack other people. Rollo, I am certainly not advocating signing this, or confusing it with departure from the EU. When I commented on hastening our departure, I was hoping that this deal would not be signed, and that the backlash will lead to us departing the EU.And I would certainly never vote Conservative, or Lib-Dem. I did read it, but perhaps my understanding is becoming fuddled with approaching old age. Thanks for your clarification. 5 at bilaterals.org a good source for all Free Trade Agreements. 6. The EU- approved Negotiation Mandate of the special, secretive High Level Working Group: http://www.bilaterals.org/IMG/pdf/eu_draft_mandate_-_inside_us_trade.pdf . This is piece of legislation is unfortunately not new. It, or something very like it, was first proposed way back in the 1990s almost two decades ago when New Labour was in power. There was a very secret agreement signed in one of the Euro offices in the backstreets of Paris that introduced this piece of legislation into the European union. It was very carefully kept out the papers. It was, however, covered by Lobster and I believe several other small press and minority or specialist political magazines. It did, however, turn up in Question Time when Jack Straw was on the panel. Straw had been defending the EU as good for British business or democracy or something like that. A young female member of the audience raised that piece of legislation in response to his point. It threw Straw, who appeared to know absolutely nothing about it himself. Either that, or else he was so amazed that a member of the general public knew about it that he couldn’t think of an answer and had to feign ignorance himself in order to get himself out of answering the question. Lobster’s editor, Robin Ramsay, is very much a Euro-sceptic, based on Old Labour opposition to the EU, and a number of other international trade agreements on the grounds that they override national sovereignty in the interest of multinational corporations. As for the example of Korea’s trade deal with the US showing how such an agreement will lead to the further destruction of British industry, one can find a similar, older example in the impact NAFTA had on Mexico. Before Mexico joined the North American Free Trade Area with the US, American industry had made hardly any inroads south of the border. Coca-Cola may be the world’s favourite drink, but down in the land of the Maya and the Aztecs it’s a very, very poor second to their national soft drink. This is a type of fizzy apple juice. After the Mexicans signed, 200,000 jobs vanished north across the border into the US, and American corporations finally started to make headway into the country. There’s also been complaints about the agreement since then from the American Right, who believe the reverse: that American jobs have gone south down Mexico way due to this agreement. Unfortunately, I don’t see leaving the EU as necessarily acting to safeguard us from agreements like this. Again, back in the 1990s, the US made overtures to us about joining them, Mexico and Canada in NAFTA. I believe very strongly in maintaining and improving our ties with our cousins in the Commonwealth, but the cost for Britain would have been far too high. Apart from the detrimental effect on British industry, it would have added further to the coca-colonisation of this country and its transformation into the 51st state. The Alternative Trade Mandate, which has just been launched, is a European alliance of over 50 civil society organisations. It is a proposal to make EU trade and investment policy work for people and the planet, not just the profit interests of a few. Then why is it so worded? The mere fact that companies can challenge government, is obscene and to actually sue a country (Greece) for accepting bailout funds, is ridiculous! Nothing but pure greed! I have been posting about this since June, everyday, I have even e-mailed; Farage, Miliband, Reed, Burnham, Berger; all with no reply? These Labour MP’s have been LYING to the people, they have promised to reverse policies and all the time they knew, once this is signed, late next year, they can’t! This is not just a trade in ‘goods’, but SERVICES, it’s a sell off of ALL our public services to foreign corporations and because of sec 75 HSCA, ‘harmonisation of Legislation’, it makes all policies Impossible to REVERSE and it ties us totally to the EU, as it will be ILLEGAL to leave! Although the focus is kept on trade-in-goods, for instance by Secretary of State for business Vince Cable, most trade in and out of the EU and the UK, is, in fact, in services. Commitments to liberalise trade-in-goods in trade agreements are very different to commitments to liberalise trade-in-services, which are about corporate rights. As the state effectively relinquishes control of the sector, corporations simultaneously gain ‘rights’. A country’s trade-in-goods commitments reduce at-the-border tariffs for goods moved across borders. When a country commits a service sector to a trade agreement, it commits to opening that sector to transnational investors (‘liberalising’ it), and to keeping it open. Service commitments inherently invoke certain rules: that transnational corporations must be treated at least as well as domestic companies i.e. domestic companies cannot be preferred (National Treatment rule) and that there is no limit on either the number of services that companies may offer in that sector or the number of firms that can come in (Market Access rule). This is supposedly to provide a level playing field, but actually, once allowed in, transnational corporations have inherent advantages in bidding, in respect of size and economies of scale, international access to credit, cheap labour, etc. The playing field is far from level. When I joined James Goldsmith’s short lived political party and pushed his leaflets through voter’s doors, I was laughed at and told that I was a ‘conspiracy theorist’ – The European Union was akin to Valhalla; springing from it’s well planned and well intentioned policies everything would be wonderful for everyone everywhere. You are a fool – if not a traitor to your country – to think otherwise. Goldsmith’s election cry was that Britain was “Sleepwalking into the European Superstate”. I get not a jot of satisfaction in having been in a minority who were correct in their assumptions about the EU – because whilst everyone in Britain with a ‘pennorth of sense surely knows we have exchanged one corrupt set of politicians for another, more powerful set of scoundrels, no one in this benighted country will do anything meaningful about it. Let me posit another theory: the Berlin Wall, did it fall or was it pushed? It was the main obstruction to the EU’s eastward expansion. If you have nothing to do one evening before Christmas, research the wall’s fall on your computer. Clues; Russia, a lack of money, assassination. For Goldsmith’s view of what we have let ourselves in for, search the ‘Sleepwalking” reference above. Politicians of all persuasions seem to lack any form of direction. Some may sow confusion because they are confused themselves, some may WANT to sow confusion with an eye on the revolving door. Even politicians on the left and on the “green” side of the argument seem to operate without a compass. Some are convinced membership in a greater bloc is desirable, some not, and most if not all talk from conviction and much less from the reading of any ideological compass, except perhaps outdated socialism which has failed to materialize anywhere in the world throughout its history due to its shortcomings in implement-ability. The shortcomings of socialism is not the topic right now, and if anyone is interested in my view on the matter feel free to contact me. Suffice to say I am not a socialist, I am a Proutist. Prout says people of any viable economic zone, such as England, have to establish protection against multinational corporations, cheap imports from slave labour countries and ownership and control of local resources by outsiders (i.e. those who have not merged their socio economic interest with the local zone – nothing to do with race or birth place). Where Prout parts ways with socialism is where it strongly emphasizes de-centralization in the economic sphere: maximum number of private businesses in the non essential small scale sector, thriving co-operatives protected by statute, and the local (not central) government running energy, service and materials utilities too complex to function well under co-operative governance. any encroachment of A on B, B on C, and C on D will lead to dissatisfaction and lowered quality of life of people who naturally want to run their own affairs. After all, who wants to give the Trans Atlantic Partnership corporates the boot only to find his or her own back yard ransacked by private and government backed concerns choking off the life blood of local businesses and co-operatives? Politicians have no ideology like this, and that is why their answers end up like a scatter-gun all over the map, with corporate interests running rings around them. This is good: I’ve put a link to it on facebook – but I’ve been posting stuff about this there for months! Doesn’t seem to have caused many awakenings… To use one of my friend James Slater’s favourite expressions – WAKE UP, PEOPLE!!!!!!!!!!!!!!!!!!!!!!!! This is horrendous and affects all our lives. The Bastards are going to win if we don’t resist this with everything we have got. The corporations will have rights over every aspect of our lives(as if they don’t already) but they will be able to take over countries as well…you better believe it…or at least find ways to prove us wrong…please do…please! Love the arguments to get out of EU from little englanders but should Scotland want exactly same thing for the same reasons to get out of Brit union we are told don’t be so stupid. We’re really not! The lot of us (here on this site) haven’t said anything at all about whether Scottish people are stupid to want to leave the union! Some might, but all haven’t. Don’t tar us all with the same brush – especially not while you’re hiding behind a pseudonym. Spooner, I hope you do leave the ‘union’, as all the big noises know, you will be free from this mess they call the TTIP, as your vote precedes this, which is why they all want you to stay. A separate Scotland, leaves a place for people to ‘bolt’ to from the EU mess and you will no longer be under their control! It is hard to keep anything big on a national scale secret nowadays. Big companies do have their place and can be useful-for example providing jobs, and me getting my non-alcoholic Christmas Puddings every Christmas from one of them. But they should know their place and not try and take over countries and act like a rl version of the Trade Federation from Star Wars. And they certainly should not be making the laws, or in effect trying to enslave, reduce to crime, or kill disabled people. http://www.avaaz.org/en/stop_the_corporate_death_star_2/?rc=fb&pv=43 Twelve governments are about to agree to a super secret trade deal that would kill our rights to free internet, to label GMO food, and would even allow cigarette companies to sue governments and overturn laws protecting our health. It’s almost too crazy to be true, and we’ve only just got enough time to stop it. While 600 corporate lobbyists helped pen the Trans-Pacific Partnership, our elected representatives haven’t even seen a draft text! The chief US negotiator even admitted deals like this only succeed because they’re kept from the public eye. They think they can squeeze it in under the wire, but if we all shine a light on this Corporate Death Star we can force negotiators to reveal the shady deal, and delay the treaty. On Friday trade ministers head to Singapore to hammer out a final deal. Bluntly put we have three days to stall the talks and save our democracies. Once we are 2 million strong, we’ll take out a full page ad in key newspapers to expose the secret deal and show the negotiators we’re watching. Sign the urgent petition and share with everyone — let’s help stop this deal before Monsanto starts uncorking the champagne. 736,091 and counting……..
Mike, thanks for being my wing-man on this one! I am getting quite used to upsetting people on VP. It somehow seems that I just don’t ‘fit in’. Never mind, I will keep trying! I just don’t like it when commenters get personal at each other. Let’s all talk about the subject in hand, not each other. I wasn’t being abusive intentionally, just pointing out your tongue in cheek reply! I have just started an e petition on this, it takes seven days to be cleared. Once cleared we only have a small amount of time, as they are looking to sign it next June, I was led to believe it would be late in 2014. Let us know when your petition becomes public and I’ll publicise it. Leaving the EU is best for the UK in my opinion. Too many decisions that are detrimental to Britain’s interests are made in Brussels by faceless beaurocrats, such as the opening of it’s borders to all and sundry when a bad unemployment and housing situation already exists one that immediately comes to mind. As for trade, I don’t see that being effected that much. Those countries that trade with the UK will still continue to do so and we existed quite well pre-EU thanks very much and could do so again, added to which we’d save a fortune in aid to EU countries that need bolstering to survive. I think the ordinary British person on the street has had quite enough of being pushed around by Brussels. I certainly did and moved to the USA. Great Britain has fought countless wars over hundreds of years to keep her sovereignty and the European riff-raff out so why should we give it to them for free now ? Get Britain out of the EU now and have done with them ! If this happened I’d gladly return, but right now I’m far better off in the USA which rankles, as I do love my homeland. Your comments would be better addressed to https://mikesivier.wordpress.com/2013/11/05/sleepwalking-out-of-the-eu-the-gap-between-rhetoric-and-reality/ than this post. We’re not talking about leaving the EU here. We’re discussing the more immediate possibility that an agreement imposed on UK citizens by the EU – and with the consent of British MPs (even Eurosceptics) – will rob us of our democratic rights. Leaving the EU is not an option that is on the table here – assume it isn’t going to happen and then consider what other options are available. Mike, you are absolutely right about that. I was about to write something similar. Here is just one reason why democracy is at stake. Suppose a cartel buys up all healthcare provisions in a region (in sweden: a county). Then politicians, local abd national, would lose control of care there.For any attempt at regulation would be subject to the secret Invester-state arbitration systems within TTIP. All decision making would then be done solely by corporations. Good point Mike. We must not get caught up into thinking that this is some EU plot. The chances are that an independent UK would sign up to this just as willingly, and perhaps a bit more quickly. Most definitely under a Tory government with their connections to big business! I think you will find it was EU led, by Mandleson, when he was Trade Commissioner, back in 2005. Pingback: PETITIONS TO SIGN: STOP TTIP/TAFTA & THE TPP. Thank you for this article. The more of these the better. I am glad to note that the Save NHS groups and the anti-fracking groups in facebook are getting on board and realising the threat. Hopefully, Singapore may have at least postponed the Trans-Pacific Partnership, which should give European activists more time to derail the whole thing. From what I gather one of the most enthusiastic supporters of this corporate coup d’etat are the CityUK a.k.a. City of London Corporatocracy. 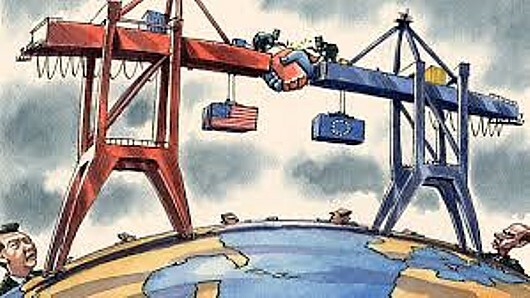 The EU- US Free Trade Agreement is a great way to spread City of London influence and all the politicians can carry on blaming Europe. OccupyLondon have started the StopTTIP for the U.K. and we do need more people to participate, especially researchers. The next meeting in the new year is January 6th 2014, 1830 hours. At the Unite Offices, 128 Theobald’s Road, London WC1. Nearest tube is Holborn and just a short five minute walk, towards Russell Square. Yes, I was late coming to this – which shows that they have been careful to restrict information about it. The only information you will get from BBC, is it’s a good deal for trade, as it lowers tariffs, therefore making goods cheaper, but they don’t tell you the bad points, like; all our Public Service Rights will be sold off, giving companies the right to sue government, if they introduce or change rules, that affect their profits. So, if government raised minimum wage, or introduced a Living wage, they get sued! The fact we will not be able to REVERSE policies, made by previous governments, or leave the EU, because of sec 75 HSCA! The European Arrest Warrant kicks in and we lose the right to trial by jury and innocent until proven guilty. Basically all our democratic rights wiped out, by this TTiP agreement! Here is some recent information. It seems that TTIP will contain mechanisms for setting up *new* mechanisms (for what? ), as time proceeds. Where will that end? http://corporateeurope.org/publications/regulation-none-our-business. .
I’ve been reading about this & signing petitions for some time via groups like Politics for People & ALTEREU. I can’t believe people interested in politics aren’t aware of TTIP & ISDS. There’s plenty ways to find info & take action (if you can travel to Europe to lobby). If you join them on social media be prepared for a lot of tweets in European languages! “Thank you for contacting me regarding the potential impact of a EU-US trade agreement on public procurement. I share your concern about the alarming pace of NHS privatisation under this Government and I agree that this could damage the culture and character of one of our most cherished public services. I also appreciate that there has been concern expressed that this creeping privatisation of the NHS could be further extended through the Transatlantic Trade and Investment Partnership (TTIP) that is currently being negotiated by the EU and the USA. It is important to bear in mind that this free trade agreement – negotiations for which are only at an early stage – could potentially lead to significant economic benefits for the UK, the EU, the USA and the wider global economy. Indeed, TTIP could help bring jobs, growth and new trading opportunities to the UK economy and I hope that it will be possible to agree a treaty that capitalises on this. Well we can see that this person doesn’t appreciate the realities of the situation. Nobody entering a free trade agreement with the USA has ever benefited from it. The fact is that the larger partner always reaps the rewards. Couldn’t agree more Mike. Did I mention that my mp is a labour party mp and one of Ed Milliband’s top advisors? It’d be amusing if it wasn’t so unamusing. The only way is to call Article 50 or ‘Repeal’ the European Communities Act before the TTIP becomes law, because with TTIP we lose our sovereign and democratic rights and ‘repeal’ will not be allowed by future governments? We are being well and truly stitched up! Reblogged this on Mabbo spews forth.